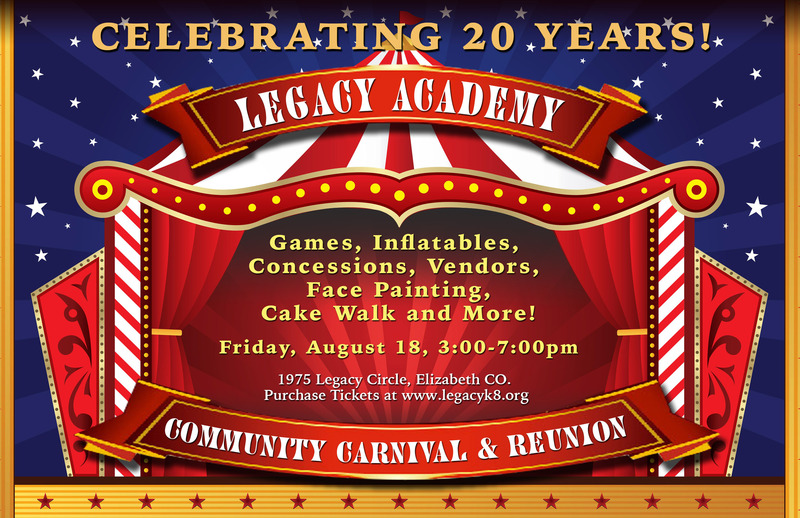 Friday, August 18 ~ Come join us at our Community Carnival at Legacy Academy. It will be held during “Back-to-School Night” from 3:00 pm to 7:00 pm. There will be fun for all ages. We will have large inflatables, carnival games, face painting, a cakewalk, food, and local vendors. Purchase your tickets early for a great discount through our website. (Admission is FREE, Games require tickets/wristbands.) You can pick them up at the will call booth and avoid the lines! (All sales are final). All Kindergarten Parents- There is a 30-minute orientation in your student’s classroom at 4:00 pm. Teachers want you to know what to expect for the 2017-18 school year. Elementary students- If you ordered a supply kit, it will already be in the student’s classroom. Middle school students – Please do not bring supplies to Back-to-School Night, because we will not have locker assignments until the first day of school. Middle school supply kits will be handed out their first day. 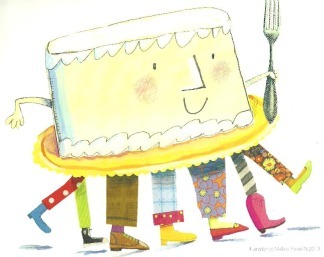 We need yummy baked goods for our Community Carnival Cake Walk. Items that can be broken up into smaller portions would be ideal (cupcakes, brownies, cookies, etc.) Please have all items dropped off at Legacy Academy by Thursday, August 17th. Allergy friendly items welcomed too (please label). Don’t forget to record your volunteer hours for helping us out!! Our 2017-2018 school year is just about to begin, again summer break has flown by. Just a few short weeks and students will return. We are always so amazed at how quickly they grow through the summer break and excited to see everyone again. Thank you for choosing Legacy Academy, it is a privilege and honor to serve you. The office team will return on Wednesday, August 9, 2017. Please review the calendar all the way through. Important Notice: If you qualified for free or reduced lunch in the Elizabeth C-1 school district 2016-2017 school year or have a special need, you can qualify for a backpack full of some free school supplies. Your children may need additional items, but it will be a good start. We are asking parents to email anne.stanley@legacyk8.org if you have a need. Free & Reduced lunch applications can be accessed with this link: APPLICATION. It cannot be filled out until thirty days prior to school start date. Uniform & School Supplies – Tuesday, August 8 our PTCO is having a used clothing sale 3:00 pm – 6:30 pm in the cafeteria. For those of you getting clothing and school supplies, here is the list. School Supply List 2017-18. Our Uniform requirements can be found under resources/parent-student handbook Vll. and/or page 36. The source code for French Toast is QS5JCKC (www.frenchtoast.com ). This is a great way to look at our uniforms. Remember you are not obligated to purchase uniforms anywhere specifically, as long as they look the same. Elizabeth Walmart also carries our uniforms but could have some in inventory that is not our approved items. Monday, August 7 ~ Wednesday, August 9th Middle School Girls Volleyball Camp, at Legacy Academy Gymnasium 9:00 am – 12:00 pm. The camp cost $20.00. Please check the legacyk8.org website, (under Athletics) for sign-up information. If you have additional questions you can email micah.chadrick@legacyk8.org or jessicahaigh430@gmail.com. 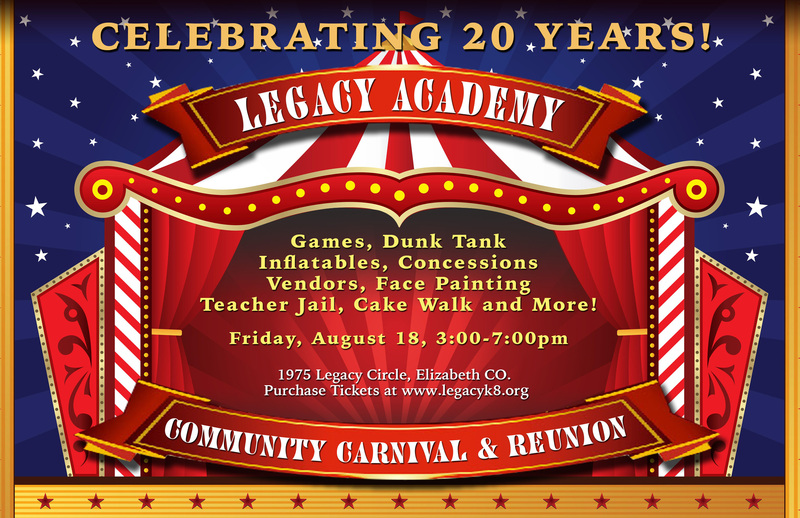 Friday, August 18 ~ Come join us at our Community Carnival at Legacy Academy. It will be held during “Back-to-School Night” from 3:00 pm to 7:00 pm. There will be fun for all ages. We will have large inflatables, a dunk tank, carnival games, face painting, a cakewalk, food, and local vendors. Purchase your tickets early for a great discount through our website. (Admission is FREE, Games require tickets/wristbands.) You can pick them up at the will call booth and avoid the lines! (All sales are final). Monday, August 21, 2017~Legacy Academy middle school students have the opportunity to attend an optional trip to experience the total solar eclipse on Monday, August 21, 2017. Before we allow your student(s) to attend we need parent/guardian permission and we will require payment to reserve your student(s) seat(s) on the charter bus. Please complete this brief form to let our staff know that you wish to grant or deny permission for this trip. The Legacy Academy Middle School team is excited to give students the opportunity to see a TOTAL solar eclipse. This is a really big deal as the last total solar eclipse was 38 years ago in 1979, in the Continental U.S. (Pacific Northwest). The next one this close to Colorado will be in 2045. Monday, September 11, 2017 – Patriot Day Observation 8:00 am in the gymnasium. Please invite all your friends and family who serve our country in the armed services, also firemen and women, nurses, doctors, police officers, teachers etc. to our celebration! All children involved in a community service oriented club may wear their uniforms including Girl and Boy Scouts, AWANA, ROTC etc. on this day. We are in need of brunch items. Donation costs and time count towards volunteer hours! Please e-mail Ms. Anne if you can help at anne.stanley@legacyk8.org. PTCO Used Clothing Sale 3:00 pm – 6:30 pm in the cafeteria. Informational Tour at 6:00 pm. Children welcome. If you have not participated in a tour of our school, we highly recommend you attend. If you know someone interested in the child (ren) attend Legacy Academy, please let them know! Sixth grade Orientation in session 12:00pm – 3:15pm. Please have your student eat before coming and bring a snack and water bottle. All sixth-grade parents please plan on parking and walking your students to the gymnasium and staying for a 45-minute orientation. Teachers want you to know what to expect for the 2017-18 school year as well as the Outdoor Adventure Trip. Please stop by the office to turn in documentation of the required Tdap booster immunization. Come join us at our Community Carnival at Legacy Academy. It will be held during “Back-to-School Night” from 3:00 pm to 7:00 pm. There will be fun for all ages. We will have large inflatables, a dunk tank, carnival games, face painting, a cakewalk, food, and local vendors. Purchase your tickets early for a great discount through our website. (Admission is FREE, Games require tickets/wristbands.) You can pick them up at the will call booth and avoid the lines! (All sales are final). Kindergarten through Fifth-grade assessment testing, teachers will call you for an appointment. Assessments last around thirty minutes. Back to School Night for All School from 3:20 pm to 6:30 pm. No School/Elementary assessment testing. This testing is scheduled by the teacher via e-mail or a phone call and by appointment only. Parents do not have to initiate the appointment. Getting Started at Legacy Academy! Please refer to the following list of helpful information and tips for families that are new to our school or if you need a reminder on Legacy Academy policies. Birth Certificates – Turn into office, email to info@legacyk8.org or fax to 303-646-2636. A copy of your child’s state issued birth certificate is required before attending school in Colorado. If you do not already have an original, please order as soon as possible as this can take over 6 weeks to receive. Immunizations – Turn into office, email to info@legacyk8.org or fax to 303-646-2636. State law requires that specific immunizations be in place in order for students to attend public school in Colorado. Please contact your child’s doctor to make sure they have the required immunizations and if needed to make an appointment. NOTE: Students entering 6th grade, must have a Tdap which is a booster immunization of tetanus, pertussis, and diphtheria. Parents who have religious or personal objections to immunizations, or students who have a medical reason for exemption, may sign a form at the school office. Please be aware that students who have exemptions will be excluded from school if an outbreak of a specified common disease occurs. Uniforms – Legacy Academy requires that all students wear a uniform. Details about uniforms are online in our handbook. Uniforms can be purchased from any retail source provided that the clothing items meet Legacy’s uniform requirements. To view or order uniforms online, use the following links. FrenchToast.com Source Code for Legacy Academy is QS5JCKC. PTCO periodically sponsor used uniform sales that are advertised in parent emails and on our website. These events are excellent times to find gently used uniforms at great prices. The clothing at these sales has often been donated back to the PTCO by Legacy families whose students have grown out of their uniforms. School Pool – Legacy Academy is pleased to continue our partnership with Way to Go/Schoolpool to assist parents that are interested in carpooling, to and from school with other families in their neighborhood. To be added to Legacy’s Carpool please register on the following secure link: https://mywaytogo.org/s/schoolpool-legacy-aach14. Questions can be directed to Way to Go at 303-458-7665 or waytogo@drcog.org . Before and After Care – Legacy Academy offers before and after school, child care for Legacy students only. Information on this program is on Legacy’s website. To view it, go to our homepage, click on “About Legacy” and the last item listed, “Before and After Care”. Medication – Students who require prescription medication during the school day must have a “Permission for Medication” form on file at the school health office before it can be administered. This form requires a physician’s signature so please print this Permission for Medication and you can take it with you to your child’s appointment. Infinite Campus Parent Portal Password – The Infinite Campus Portal allows parents and guardians to see information related to their student(s) such as household information, attendance, grades, assignments, and behavior. In order for parents to log in to this Secure Portal, they must have a school approved username and password. To receive this, parents will need to pick a password that they will remember that is at least eight characters long (including a capital and number). Email your password to Kathy.Knowles@legacyk8.org. Within two Business days, you will receive a confirmation email with your username and password. Access the portal through the Legacy Academy APP or Legacy’s Homepage. Background Check – Anyone working with children is required to have a background check performed. This includes parents going on field trips, driving for sports activities and working in the classroom. If you plan on helping in this way, please follow the following steps. Make a payment of $7 to Legacy Academy. Record volunteer hours thru Help counter.